The beginning of April found me flying to Guanajuato, Mexico with four friends from the Ashland Rotary Club. We are working with the Rotary Club of Guanajuato to bring fresh water to the rural areas of the region. In the week there, we also toured the School for the Deaf in San Miguel Allende, planted trees at a preschool, and met with many selfless people who are dedicated to serving others. I was honored to be a part of that team. Here I am with my friend, Angelica, and my wonderful hosts, Oscar and Marta. While in Mexico I got a message from my sister that my Dad was once again in the hospital, so instead of returning home at the end of the week, I took a plane from Los Angeles to Florida to visit him. At first, he spent a few days in the ICU and it was very hard to see him suffering. What helped make the situation bearable was that my sister and daughter were with me and the fact that my Dad had several amazing nurses. My favorite nurse, Nicole, hailed from Kentucky and made the experience much easier to handle. After ten days in Florida, with Dad stable and in rehab, I was ready to go home. I went to the airport for my flight with United and saw a huge crowd at my gate. The details are too long to go into, but the final result was that I gave up my seat in exchange for travel money and a flight home the following day. I was happy as I’d see my Dad one more time and the travel credits will come in handy, but what blew me away was that the gate agent, Beth, booked me in first class all the way home! If I could have, I’d have made her a pie too but instead I gave her a pretty shell and thanked her for her grace and calm under pressure. Clearly he didn’t know who he was taking to! Yesterday I walked into the office and surprised a few employees with a warm pie. When I shared what I’d been told on the phone the young man in charge said I didn’t have to do that… But really, I did! Later the crew sent me a sweet text message thanking me for the pie. I was so glad to receive it. Life is full of challenges and every one of us has “stuff” to deal with. I think we all do the best we can… but still, life can be hard. That’s why it’s nice when every now and then we get a helping hand with that “stuff” thanks to the kindhearted strangers (or are they angels?) who we meet along the way. In my last post, I asked what was so good about goodbye. The story behind that post was that an old friend is moving away from the area to live closer to his children and how much our community will miss him. I mentioned that I was lucky to have been given the chance to say goodbye, because sometimes that is not possible. Shortly after that post was published, a dear friend wrote to say that she’d lost a relative quite suddenly. Saying goodbye was not really an option given the circumstances and that made his passing even more difficult. My friend shared that her son was going to visit the family of the man who’d passed and when I offered to make a pie for the family, she accepted graciously. It was all I could do to help and I was grateful for the chance to assuage the pain that she is feeling. Almost ready for the oven! 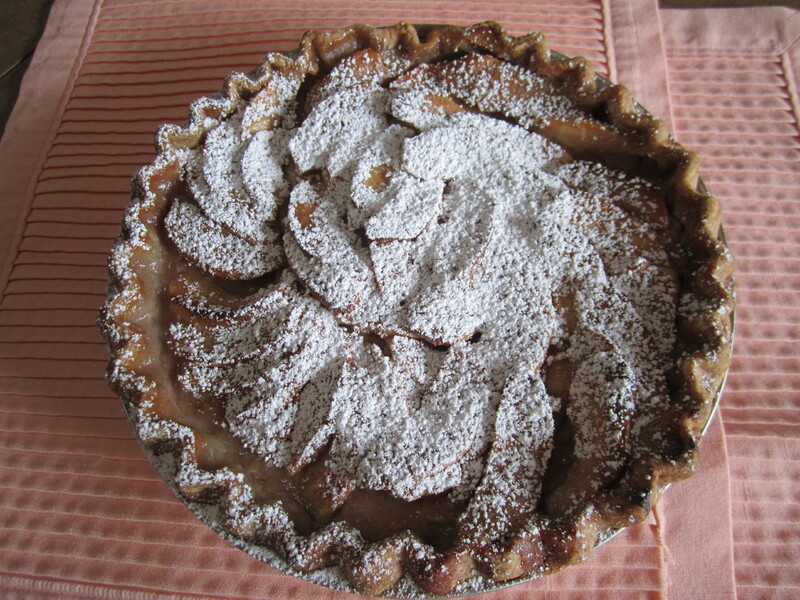 This is not to say that a pie will make much of a difference; but it is the love that was sent with the pie that might. After all, it is the very best thing that we have to offer one another on this journey called life. And it is the only thing that makes it worth living. 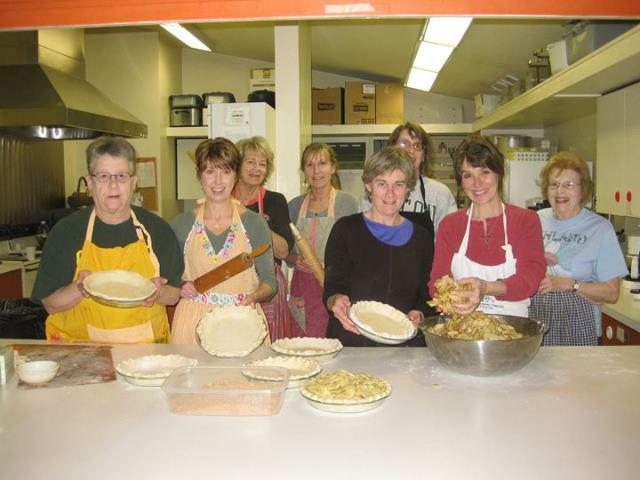 A few weeks ago, on this blog, I asked readers to recommend people to be pie recipients. 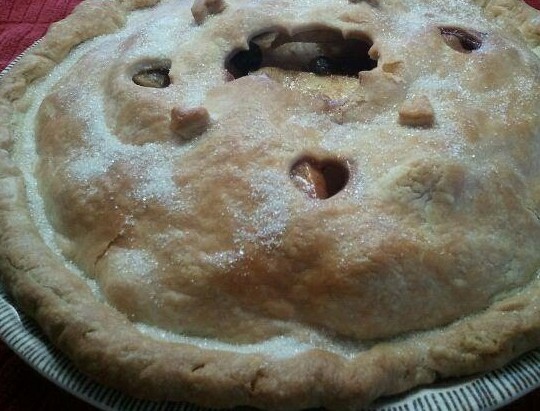 One friend wrote back and suggested that I make a pie for Paul Giancarlo. It didn’t take long to think about this suggestion for who deserves a pie more than the person who has found a way to keep our local food pantry stocked? 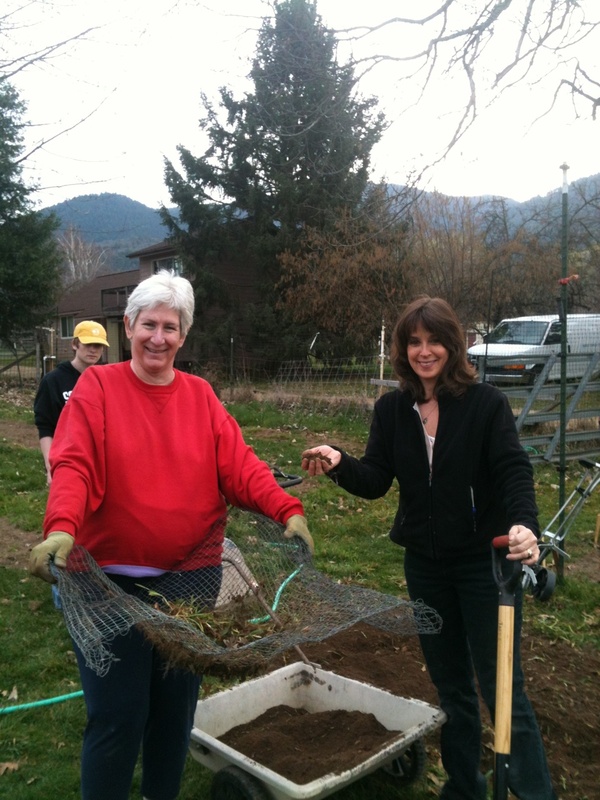 For those of you who don’t live in Ashland, Paul is the co-founder of the Ashland Food Project. This is a plan whereby families opt to buy one extra food item per week and set it aside for the food bank. Every eight weeks, these items are picked up by a group of volunteers who then bring it to the food pantry. Another great day in Ashland. 19,000 pounds of food from AFP green bags were dropped off at the Ashland Emergency Food Bank today. Isn’t that remarkable! In July, Paul received the eTown E-Chievement Award for his work with the Ashland Food Project. This NPR show was taped at the Britt Festival in Jacksonville and a large group of AFP volunteers were in the audience cheering for Paul. As much as I wanted to be in that audience, I was unable to attend the show because I was preparing to cater a weddding the following day. However, I did get to listen to the show when it aired on the radio and you can see his interview here. Last night I just happened to be at a restaurant where Paul was celebrating his birthday and I was introduced to him. I thought it best to ask him what kind of pie he liked and told him that at some point I’d be bringing him a pie. And when I woke up this morning, I thought, why don’t I bring him a pie today? 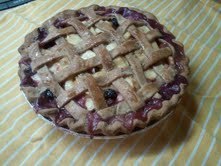 This afternoon I delivered an Apple Blueberry Latice pie to Paul and his wife Mary. They welcomed me in and asked about my pie project. When I mentioned that it started as a crazy idea in the night, Paul could relate because the Food Project was just an idea to begin with as well. Just think of all the wonderful things that could happen if we all were willing to listen to the “crazy ideas” in our hearts? Day 12: Roxanne – a force of nature. 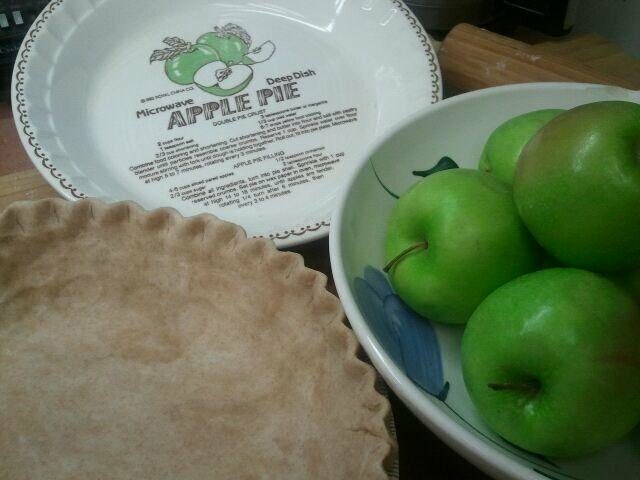 Today, the recipient of my pie is my friend and neighbor Roxanne. We were co-presidents of the PTA at Helman School a number of years ago. She was the “voice” of the PTA – running the meetings, etc. I was very happy for that – and willingly did what ever else needed to be done. I would never have taken on the role of president alone, and was very grateful to have someone who was”fearless” to work with. You may have met Roxanne around town. She is a true force of nature! She teaches classes like kick boxing – with the energy and encouragement necessary to keep you going. She can make you laugh – but also makes time to listen if you need to talk. She is real in the best sense of the word and we are lucky to have her in our community. 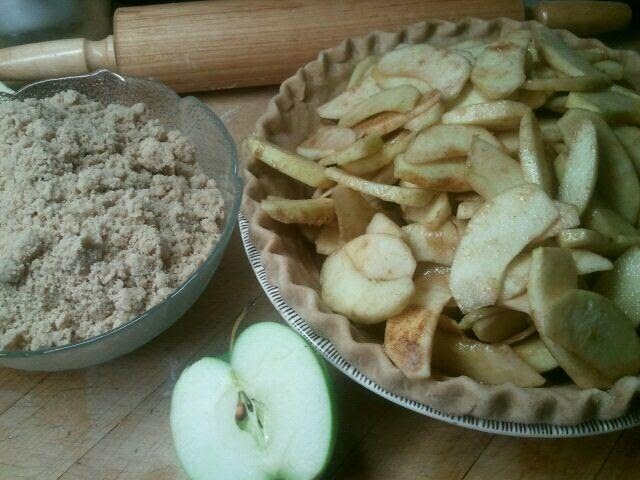 Won’t she be surprised when she comes home tonight to be greeted by a warm apple pie? This “pie a day giveaway” project began as a way to bring a bit of happiness into someone’s life. So far, I think it is going well. Everyone has been genuinely pleased to receive a pie. In fact, most folks have been quite surprised. How fun is that? Amazing that I can have such impact with such a small effort. What that tells me is that we don’t “go out-of-the-way” for each other as often as we might. I hope that someone out there is inspired to follow my example and make something for someone who has made a difference in their lives. On a completely different note, check out commedienne Jeanne Robertson. In this video she talks about her husband, LB (left-brain). It’s a hoot.